This is the third installment of Nina MacLaughlin’s Novemberance column, which will run every Wednesday this month. Anselm Kiefer, Nigredo, 1984, oil, acrylic, emulsion, shellac, and straw on photograph and woodcut, mounted on canvas. Three uncarved pumpkins the size of candlepin bowling balls stud the mulch in the front garden of a neighbor’s house on the short street where I live. City creatures—squirrels, raccoons, rats—have chewed coin-size circles through the tough outer rind and into the stringy pale flesh below. These sections of gnaw are now ringed with black. The black of rot, a black that looks at once dusty, as though charred by the flame of time, and slick, like the vegetal squelch of something long forgotten in a drawer of the fridge. It is a definitive black, the black of something making slow return to a different state. Along the river, the milkweed pods have split and pour forth their seeded snow-white silk. I walk south along the river when the sun is in the final stages of its work, and scramble down the banks to look. Off tall stalks, desiccated pods spill a thrilling and climactic white. White like rabbit fur, like pearl, white that holds rainbows when the light hits right. The leaves of the young gingko trees that grow out of the sidewalk fell all at once. A few days ago, the fan-shaped leaves with their crenulated margins glowed gold from the branches and fluttered with nonchalance. The following morning, I gasped to see it: branches all but bare and the trees seemed to grow out of puddles of gold. At the cemetery nearby, a twisting Japanese maple is aflame, its feathery leaves a deep red, a bodily red, a red that blazes between wine and blood. Those leaves will grip the branches much deeper into the month than most of the trees around it, almost tauntingly, in a flare of lingering crimson. These are the colors of November in the neighborhood. In alchemy, nigredo is the first of four stages in the process of transformation, defined by the blackness of putrefaction and char. The following three stages—albedo, citrinitas, and rubedo—are likewise associated with color: white and gold and red. In analytic psychology, nigredo is the stage where one descends into the chaos and darkness of the unconscious and encounters; in Jungian terms, the shadow. 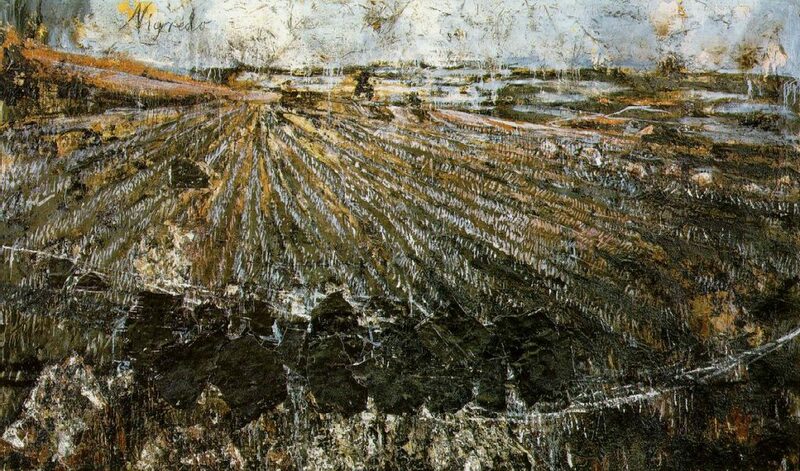 Kiefer’s field is forbidding, grim, but it is no wasteland. With that one word he makes us know that the November crunch of dead earth below the feet holds the promise of rebirth, of coming out the other side of the dark. Pieter Bruegel, The Return of the Herd, 1565, oil on panel. 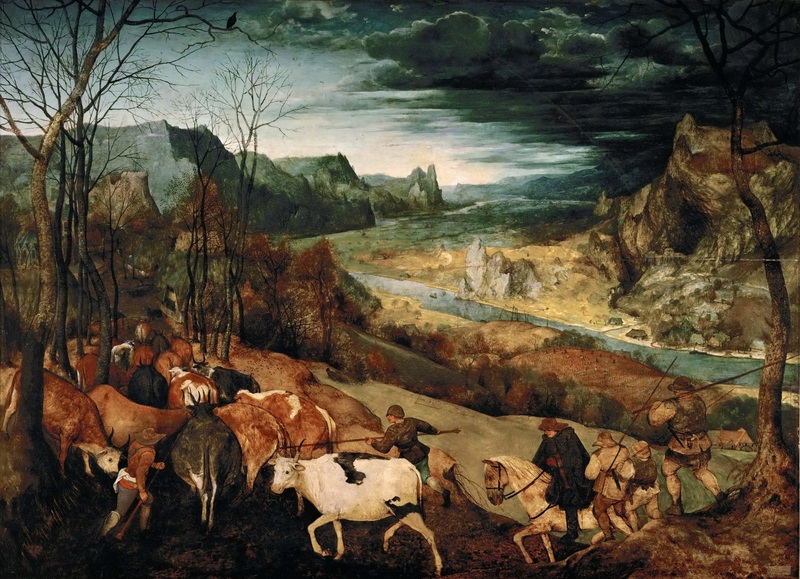 A black cloud approaches from the east over a craggy river-valley landscape in Bruegel the Elder’s 1565 depiction of November in Return of the Herd, one of a series of paintings he did depicting the months. The palette is all ochres, golds, and grays. Bruegel was a painter of ruddy-faced merriment and mischief, of soup bowls and warm loaves and codpieces in taverns and towns, as well as Boschian hellscapes. Here he depicts six men driving cattle down a path, away from the pasture and back to the barn, the dark cloud at their backs, winter on its way. But there’s no fear here. The dark is coming, chaos will descend, and man and animal move together without haste in the face of it, knowing what approaches and knowing what needs to be done. In Bruegel’s November, all feels orderly and a steady rumble of thudding hooves quilts the afternoon. The group heads toward protection and warmth, a roof, a hearth. Don’t be afraid: it’s there to be found. This is not a confrontation with the sublime, no approach to the abyss, the ceaseless and non-understandable, and the swooping sense of awe and doom it brings. Bruegel shows instead the natural and human world in sync and a darkness that is, for now, kept at bay. We know, though, that the darkness comes, and the vast unpeopled places terrify. An experiment in 2005 asked forty-eight university students to look at images of wild nature—let’s say pounding seas and jagged cliffs and wide canyons—as well as images of “managed nature”—let’s say a park with pruned paths and manicured bushes, with flowerbeds of tulips and pansies. The students were then asked to rate how beautiful they found these scenes. Prior to looking at the images, the researchers reminded the members of one group that someday they would die. What they found: Those who had death whispered in their ear showed less preference for the scenes of wild nature. Once death has been inserted into the mind, the magnificence of the mountain range registers in a different way, and what’s sensed instead is its gaping indifference, the nothingness of one’s flicker of existence in comparison. Managed nature gives not only the illusion of control, the comfort of our efforts to contain and command the life and growth of things, but also, I think, reveals the evidence of another human hand. In the tulip rows, the pathway fenced and mowed, we see the evidence of tools and work. Not only is there control to be had, but also, the managed landscape says, you are not alone. We’re not so far from a wilder state, a solitude at the gate of forces much older and much more powerful than us. Rules and laws and designated labors can only explain so much or offer so much order. The anthropologist Loren Eiseley knew it. He writes of a night drive down a mountain, of seeing in the woods beside the road a creature loping along, shapeshifting between the trees. He understands it as a dog, but it devolves from there into “a running weave of colors and faces into which it would lapse once more as it bounded silently into the inhuman unpopulated wood.” Eiseley shines his headlights into the forest—a stand-in for the probing gaze of science, of humankind’s search for answers—but he is met with mostly dark. In the end, moving through the woods is a flickering shape, a mystery, maybe dog and maybe not a dog at all. You don’t have to veer too far off the path, the paved road, the highway for words like dog not to matter, or even make sense. 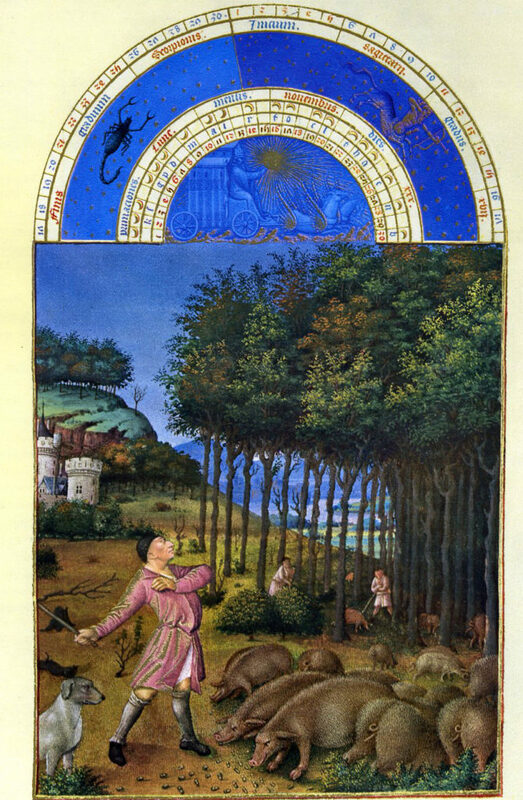 Limbourg Brothers, Tres riches heures du Duc de Berry, 1413, illuminated manuscript. In the wilderness, and at this moment in the year, boundaries between world and otherworld get a little thinner. One can lose one’s way. Labor is one way to forestall the fear, to enter the darkness ready. Bruegel’s calendar paintings follow a medieval tradition of depicting the labors of the months, the most recognizable set being those from the Très riches heures du Duc de Berry, a Book of Hours painted in the early fifteenth century by the brothers Limbourg. Each folio features the tasks and acts linked with the month—people chop wood, shear sheep, sow fields, till, harvest, hunt—underneath a lapis sky illustrating the corresponding sign of the zodiac. November’s labor here, and across many such versions, shows a peasant, thick, wearing a tunic, banging on oak trees to knock down acorns to fatten pigs for slaughter. I am no farmer. I do not keep bees or sheep. Maybe like you, right now, at your screen, I am mostly removed from the rhythms of the year. I know the days are short and getting colder. I watch the rot, the milkweed, the gingko leaves, the maple, but I won’t bang oak trees to make acorns rain. What is our labor in November now? One job: Pay attention. Pay attention. Pay attention. And every year emerge altered, ready, like lead to gold. Read earlier installments of Novemberance.